The Center for Wooden boats is one of our partners in the retreat, and they are an organization close to my heart! Their main campus is in Seattle, WA on Lake Union, but their newest campus is at Cama Beach. These folks have a mission to bring youth and adults to the water, safely and educated about our marine environment from the boat angle. As they say getting people into sails instead of cells (cell phones that is)… Another group I adore is the WSU Beachwaters, they monitor our beaches and educate the public about our marine environment from under the waves and on the shore lines. We have an AMAZING environment!! Inspired by the coral reef project, I thought “Wow! Why not crochet Puget Sound!” Cama Beach is officially the most living beach in Puget Sound (as per the Army Corps of Engineers survey), why not use nature as our inspiration, create a massive project and then help fund raise for our wonderful non-profits dedicated to educating people and preserving this unique eco-system of which we are ALL a part of! So at the retreat we’re going to work on Sea Slugs, and Anenomes, and rocks, and sea grasses and kelp… And why not use the reference guides created by WSU Beachwatchers from Island Co. WA? Though, if you haven’t noticed, I’m in full retreat mode now that we’re almost a month away! I’m working up a guideline for participation in the project from those not at the retreat! My goal is to have Center For Wooden Boats, Beach Watchers and other non-profits dedicated to our marine environment have use of this project to raise money and awareness!! Plus, it’s soooo cool! I’m working on this fella right now; the Red Octopus! This is such a fun project! I hope it inspires you to come play with us! October 17-21, 2010 at Cama Beach. Remember you can get day passes at Pinch Knitter Yarns in Stanwood, WA or via the CLF Website! So I’ll shut up now and just share some more cool things that can be crocheted! Cloudy or blue skies, the power of nature is always felt at Cama Beach. Imagine with me for a moment. It’s early in the morning on the shores of Puget Sound. You’ve bundled up for the cool October morning, cup of hot coffee or tea or what ever wakes you up in the morning, in hand you huddle with others like wise clutching their morning steam power. There is a fog bank rolling over the top of Whidbey Island coming across the water towards the shores of Cama Beach. The water is still, and dark like glass. It’s quiet, other than the murmurs and shivers of the early risers, until a lone loon wails it’s plaintive song. It’s cry echos against the hill-side, leaving everyone quietly in awe of the new day. Through the fog bank, the light of the sun coming up from behind the hillside creates a miasma of pink and purple sunrise. Shuffling off to class, bags and hooks in hand, focused on learning the new skill, or hoping to just pick up a trick or two, you find yourself draw to looking at the water. And suddenly it doesn’t matter if you are “getting it right”, you realise that you are sitting in a room with others, like yourself who love the textures of the fiber they are working with. You stop your reverie and look about the room, instead of picking up your hook you decide to watch the others. Their hands are dancing, in silent rhythms, magic is being made with a single hook and a strand of 4ply yarn. After class you gather with a new friend to sit at a table outside and have lunch. Sure it’s misting, but the fresh marine air is crisp and clean. Worries melt away, and the early morning cry of the Loon is replaced by the chattering of Bald Eagles. It’s primal, it’s touches your soul. After lunch you gather together with your friends to enjoy a talk or a workshop, and once again the hooks come out, and the inspiration flows. You’ve figured out a new skill, or a half step that just makes it so much easier. Then you hear the shout of someone from outside, “Whale! Whale!” Hooks get dropped and people rush to the shore, and the local Orcas are playing not more than 100 feet off the shore, the Bald Eagles sing out, Kingfishers dive for fish, and some where you hear a gull laugh at the folly. Beyond the crochet, beyond the new technique, beyond the learning about yarn and hooks, and fiber and color, you have had a time, that takes you back…no television noises, no non-stop chattering, no rush hour, no bumper to bumper shopping carts. The joy and awe on everyone’s faces illuminates the afternoon, and then again the crochet hooks and yarn begin to stitch their magical threads. Now for the evening program. Not just a speaker full of hot air, but an interactive event, no one cares if you’re crocheting while they talk. No one admonishes you, you’re on a roll, everyone gets that. The instruments come out and songs are song both silly and sad, fun and heartwarming. The sounds of a dulcimer echo off the hills, and you are transported to a time further back still, when humans enjoyed simpler pleasures. At last it’s time for bed so another day can begin a fresh. You wash, and change and scramble into your warm blanket, and as you rest your head on your pillow the visions of the day pass through your mind’s eye. You’ve never felt so relaxed, you’ve never been so inspired, you never expected life to be this good. Yeah, I’m pitching the retreat…but I thought instead of telling you how reasonably priced it is, and how much work we’re putting into it, that I would share my end goal with you. The above story is exactly my vision for people coming to the retreat. I have a little piece of Heaven here on Camano Island; I want to share it with you. In answer to the question, the retreat fee covers the purchasing of supplies for the workshops, and anything else I can’t get donated for our wonderful retreat goers. Morning classes are separate from the retreat fee, but that doesn’t mean you won’t have learning opportunities if you just sign up for the retreat! In the mornings we’ll be working on a Puget Soundscape. Crocheting the underwater eco-system that exists just feet from the shores of Cama Beach. I will be working on that in the next few weeks, and will start posting my pictures. A local business will host a party in the Winter or Spring (we are just creating the plan) which will be a fund raiser for a local environmental educational group, and we will use the Puget Soundscape as the center of the party! In that experience you can learn new stitches, work with new fibers, I’m providing the yarn! Our experienced staff and volunteers will be on hand to share some of their knowledge and experience. You won’t be alone in this adventure! It’s going to be fun! The Dye Workshop on Wednesday will be awesome, I’m going to try to have some light colored yarns, but please if you are coming if you can bring something you want dyed that would be great! I’m providing the dyes, and pots, and the expertise! I will teach you have to make long repeats of color for crochet, how to set your dyes, and how to make “mottled” or colorful yarns that will not pool into splotch city. I will teach several methods of dyeing including kettle dyeing and my secret recipe will be unveiled for oven dyeing! Sounds like a bang for your buck to me! Plus we’ll have music and speakers, and an opportunity to give back to Center For Wooden Boats who have generously partnered with us! We’ll be making afghan squares in nautical motifs for the project. Don’t know how to do color work? excellent time to learn, and we’ll be on hand to help! So you see, as much as these are experiences, they are learning experiences as well. Yes, we will play and have fun. But it’s kind of like my “Craziest Yarn” competition at the Stanwood Camano Fair, if you can spin the weirdest, wildest yarn, and get feathers and foamy bits and straws to stay in your yarn, the next time you go to spin a sock yarn you’ll find it that much easier . There is always method to my madness!! So, come on JOIN US! You know you want to! Before I get down to brass tacks and business, I want to thank you all for the beautiful messages of condolence. I’d like to say that I’m “over it” and moving on, but I can say, I’m merely moving. Truth be told, I’ve experienced a lot of grief in my life and it is really no stranger. This time though it’s just a wee bit stacked up, and I’m just trying to put one foot in front of the other to get my work done in between fits of pouting and mourning. Sometimes life just ain’t fair. And again, thank you so very much for your kind words and thoughts. So, maudlin blahing aside, here’s the work at hand. Please register for the retreat by going to the CLF Website !! I know I’m going to need it by October, that’s for sure! I even added a new afternoon workshop: How to Dye Yarn for Crochet! Ooooh yeah, we’re gonna have a good ol’ fashion dye party! 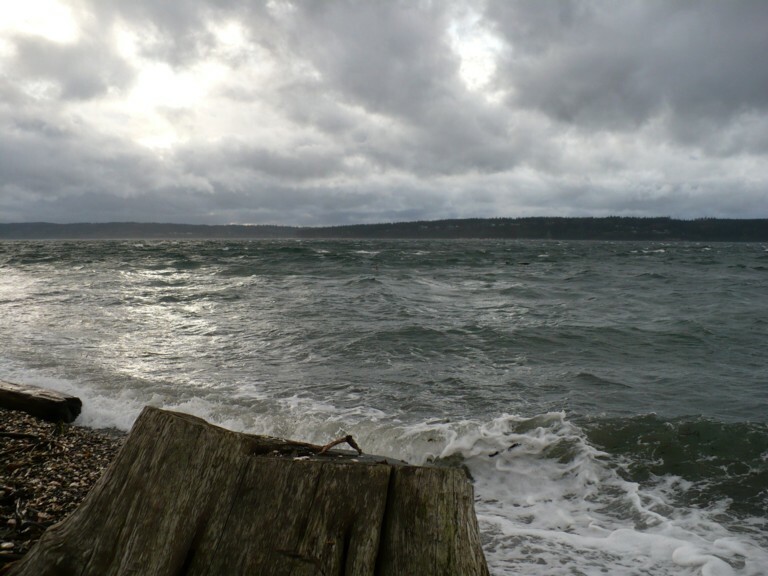 The retreat is October 17-21, 2010 at one of the most beautiful venues you can find in Puget Sound!